Please note, for the academic year beginning in fall 2019, the Game Design degree will be part of the exciting new Art and Design program. While having a common core, the program will allow for emphases in Digital Art, Fashion Business and Design, Game Design, Graphic Design, and Web & User Experience. Please check back here in mid-April for updated details on this exciting new opportunity, or reach out to Dr. James Hutson for more information. 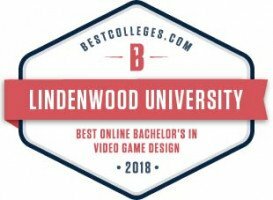 Lindenwood University offers you the chance to earn a bachelor of arts degree in game design. The Game Design program is designed to prepare you for working in a game studio environment. The curriculum for the game design degree includes advanced game design and production courses, allowing you to move from conception to application covering key industry concepts ranging from aesthetics and immersion to usability and game economics. You will also study foundational topics like storytelling and character development. Project and portfolio courses are threaded throughout the curriculum and are dedicated to providing a relevant and comprehensive curriculum. Game Design instructors at Lindenwood University are some of the most knowledgeable around. They have the educational background and real-world, professional skills that allow them to understand the changing landscape of the industry, preparing you for a career in game design. As a Game Design major at Lindenwood University, you will study in either an online or hybrid environment, combining online classes with on-campus, face-to-face, courses. The bachelor of arts (BA) degree in game design requires requires major coursework in addition to the general education requirements. Online and hybrid courses in game design include Game Development, Concept Design, and 3D Animation. What Can You Do with a Degree in Game Design? Game design is a competitive field, and the median salary is in the $58,000 range. Different areas within the industry, including game designer, game programmer, and game artist, all have their specialties. Mechanics designer, writer, concept artist, modeler, art director, engine programmer, and audio programmer are all careers under the game design career umbrella. For more information about the Lindenwood University School of Arts, Media, and Communications, please call Jeremiah Ratican, Game Design program director, by telephone at (636) 627-4418 or e-mail at jratican@lindenwood.edu, or contact Lindenwood University Admissions at 636-949-4949 or by email at admissions@lindenwood.edu.